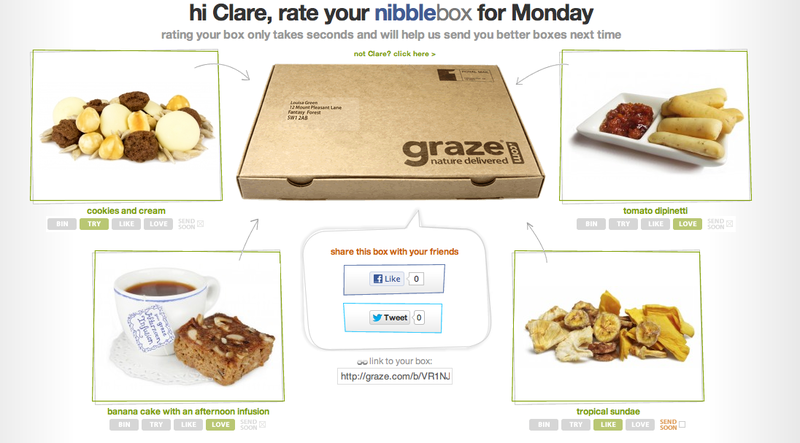 Mrs Brown's Thoughts: Graze, My First Ever Review! Signed up to the latest craze in food box and I am not promoting the boxes just wanted to do an honest review as I absolutely LOVE them. I didn't expect to, but I do!! 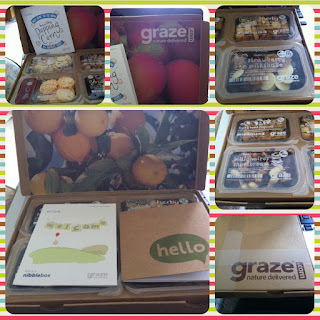 So I had read about the Graze box a few places, thought about it but let it go, until I saw a cheeky deal on Groupon and thought what have I got to lose. I have had three boxes now and I have tried some things I never thought I would. Choose where you would like them delivered - work, home, one off gift? Then what kind of box do you want? Then start rating! Have a look at the goodies they have on offer and give them a better idea of what to put in your box. So I felt totally in control. I clicked 'bin it' for all the stuff I knew I just wouldn't even try and 'love it' for the things that sounded amazing. My first box arrived. On the day I nominated. I thought I'd take some pics as I was quite excited! The box says 'Please turnover, unless you want to make a mess'. I was worried, how will this work? I needn't have. The nibbles are in cute little tubs. They were kinda smaller than I expected. My eyes were bigger than my belly though! Each snack is just the right size! Perfect for a snicky snack that keeps you full, is damn tasty, and you know everything that's in them so great if your watching your weight!! I have been taking them to work as I get bored with sandwiches and these little treats are great to snack on throughout the day. I say treat, because the flavours are amazing. I can be a bit picky and tend to go for safe options. I have been mighty impressed with every little pack so far. The rice cracker thingys packed a punch, the breadsticks were crunchy and flavoursome, the salsa dip was like no other. The simple combo of black pepper and pistachios was stunning. That's the savoury stuff now onto the sweet. Marvellous macaroon. That names start the taste buds tingling. Amaretti biscuit pieces, white chocolate, coconut flakes and almond slices. I think this is my favourite so far but it is a hard run race. They just cover all bases. The names, the portions, the flavours I think they have things just right. If you've been thinking about it, why not give them a go. As far as snacks go, they are so convenient (delivered to your address!) there is so many options, and for £3.89 a box I think they are soo worth it.